In the Magic Cast-On article, I mentioned that it could be used to start small circles, like top-down hats and bottom-up bags and such. But I never really explained how one would do that. A few people have asked, so here’s a little tutorial. You can click on the pictures to see a larger version. In this picture, I’ve used the Magic Cast-On to place 5 stitches on a pair of DPN. As usual, the tail is over my index finger and the working yarn is over my thumb. The first stitch cast on is on the right on needle A. Because I’ve cast on an odd number of stitches (5), the last stitch is the one on the left on needle A. In this picture, I’ve rotated the needles. 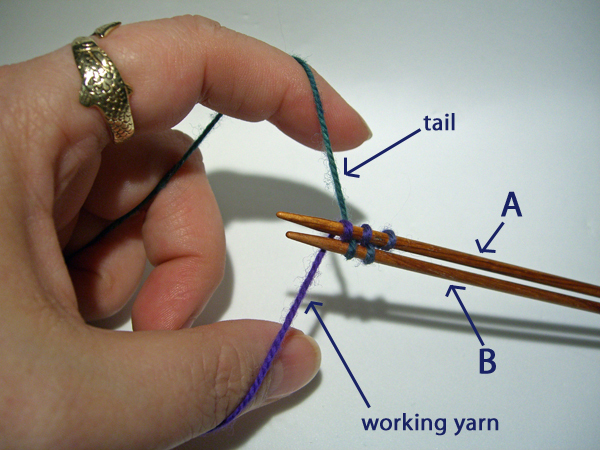 I’m going to knit the stitches from needle B using needle C.
Note that I’m holding both the tail and the working yarn together. 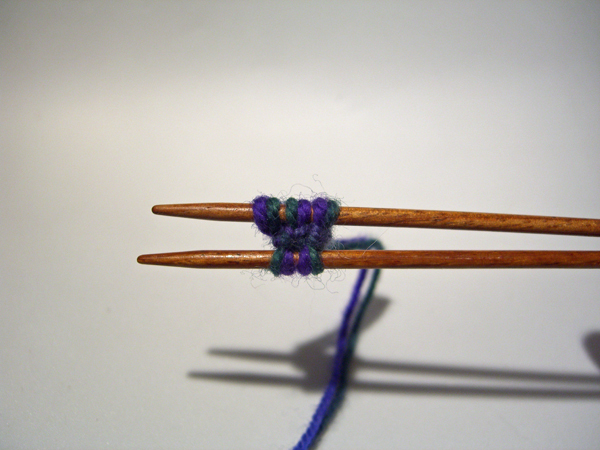 I’m going to knit all 5 stitches using the double strand. Now I have knit 5 stitches, and I have 10 yarn loops around the needle — one loop of tail and one of working yarn through each of the original 5 stitches. On the next round, I’m going to knit each individual loop. By knitting each pair of loops individually instead of together as one stitch, I will double the number of stitches I have on the needles from 5 to 10, without doing any M1 increases. And here is the result of the last step. I now have 10 stitches on the needles. 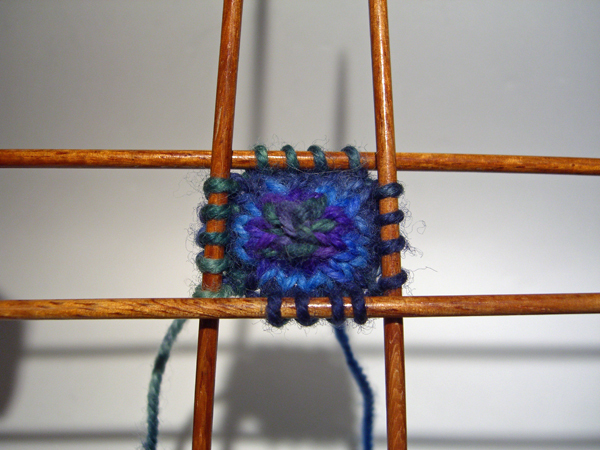 I’ve added another DPN because that makes it easier to knit around the circle. Here is the circle after several rounds. After the second round, I used regular M1 increases to increase from 10 stitches to 17 and added in a fourth DPN. There’s nothing significant about the number 17, I just wasn’t really good for this demo about increasing at a regular interval. You, of course, gentle reader, will do better. But note that I have a neat, closed circle. There’s no hole in the middle. And I didn’t have to mess around with tightening anything up or trying to close the middle. Using the tail held with the working yarn to double your stitches is optional. But sometimes that first increase round can be intresting. This can make it a little easier. The double-yarn increase method works great as long as the last stitch you cast on is on needle A. If you need an even number of stitches to start your circle, simply start the Magic Cast-On around needle B instead of the more-usual start around needle A. 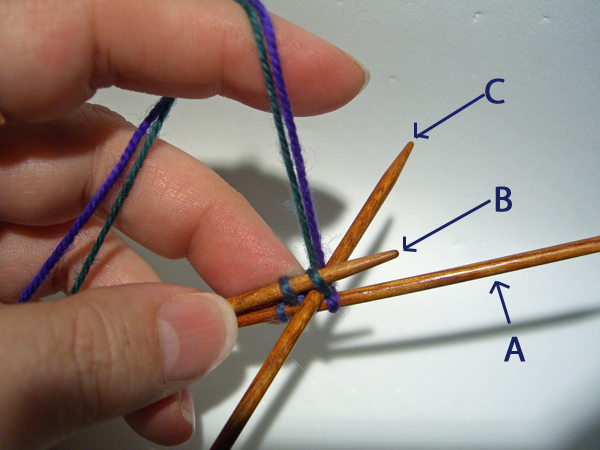 By starting around needle B and casting on an even number of stitches, you will end up with the last stitch cast on around needle A, just where it needs to be. And there you have it! This works well for hats, round bags, pinwheel blankets and star toes on socks. I used this method to start the Spanish Lavender Basket Wave socks with 6 stitches. The method can be used with DPNs, as I’ve shown it, or double-circs or magic loop. I demoed with DPNs only because it’s easier to keep them stable when having only two hands to juggling lighting, props and camera. Very cool! I’d forgotten you said that. I’ll have to play with this; I love new “toys”! Thanks so much! Oh yes it is magic—sheer bliss! I was so smug the other day when I used this with magic loop to cast on for the square kerry blue shawl! Nice! I like the knitting double for the first increase round too. You are so handy! Too bad I didn’t see this tutorial two weeks ago when I was trying to get a diagonal pattern hat to close at the top. The finishing instruction said to sew the cast on edge to the cast off edge which left me with a square crown. 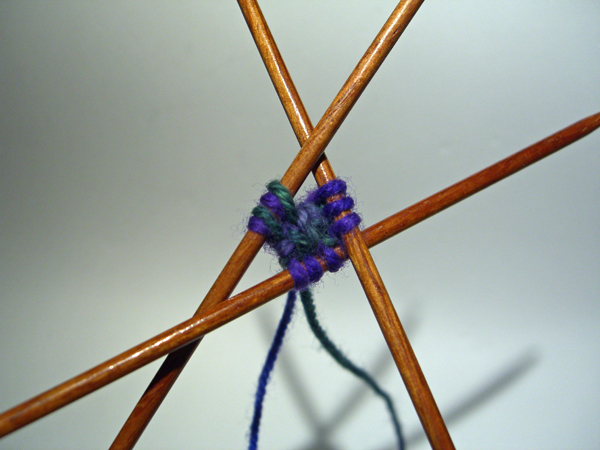 Therefore, when I had to run a few running stitches near the top and then pull both ends of the yarn to form the circle. Well, pulling caused the yarn to break and there was an awful lot of yarn that had to be shored up into the crown. All I can say is that the hat did not come out with a perfectly rounded crown. I think I will try to adapt the pattern to a top down one using your tip. Thanks for the information.